the norm, the moonshiner represents the triumph of the individual over the law, a lone man or woman bravely defying the majesty of the state. Let’s start with the facts: Clyde May was born in Conecuh Ridge, Alabama in 1925. He served with distinction in World War II, earning a Purple Heart and Bronze Star while commanding a 12-man rifle squad. When he came home, he survived by making whiskey in a still he designed and built himself. This is where fact and legend begin to blur. Most sources report that May produced and sold 300 gallons per week from the 1950s up to 1973, when he was arrested and incarcerated at Maxwell Air force base for moonshining. After his death in 1990, his son Kenny carried on the family business, which was ultimately legalized in 2001. The vindication of Clyde May occurred in 2004, the state of Alabama proclaimed Clyde’s Conecuh Ridge Whiskey to be the official state spirit. It’s generally understood that the legislature wasn’t referring to the raw product that came off the still, but rather to the stuff that Clyde held back and aged in charred oak barrels. But what exactly is Alabama whiskey? While the mash bill may be similar to bourbon, it’s distinguished from the Kentucky spirit by the addition of dried apples as a flavoring. That practice probably would cause derision on the Bourbon Trail, but Alabama ain’t Kentucky. The truth is that Alabama whiskey is slightly fruity and utterly charming. It has a telltale reddish color and an intriguing aroma of citrus, apples and baking spices. 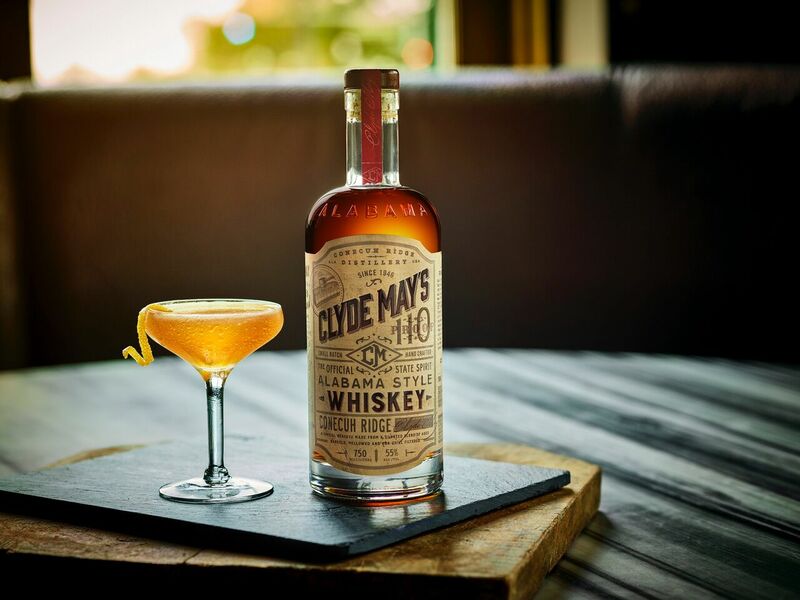 Despite six to seven years of barrel aging, Clyde Mays Alabama Style Whiskey (85 proof/42.5% alcohol, $38) is supple and easy to drink, with overtones of caramel, butterscotch and orchard fruits. You could make a cocktail out of it, but you really don’t need to. Clyde May’s Cask Strength Alabama Style Whiskey ($110) is a totally different animal. Aged 10 years in oak barrels, it comes in at a substantial 117 proof (58.5% alcohol). Aromas of stewed fruits dominate the nose. In the mouth, the spirit is rich, deep and unctuous, permeated with flavors of citrus and apple and dominating the palate with a long, resonant finish. Clyde would be proud.